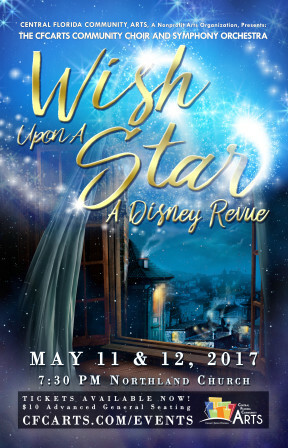 This spring, the Central Florida Community Choir and Symphony Orchestra invite you to enjoy the wonders of “Wish Upon a Star”, a Disney revue! Following up on their successful 2012 production of “When You Wish”, the music of Disney, the CFCArts Community Choir returns having nearly doubled in size since 2012 to over 300 voices. Featuring moments from such storybook classics as Cinderella, Peter Pan and The Jungle Book, to more present day blockbusters like Hercules, Frozen and The Lion King, this fully produced, multimedia experience will take the audience on a journey through the expansive worlds of Disney. Find out what happens when you “Wish Upon a Star”! Coming May 2017. “Wish Upon a Star” will be held Thursday, May 11th and Friday May 12th at Northland Church, 530 Dog Track Rd., Longwood, FL 32750. We are offering the convenience of assigned seating for this event! That’s right, you will be able to CHOOSE YOUR SEATS when you order your tickets. All seats in the auditorium will be assigned and will not be first come, first served. So buy your tickets now! Tickets are $10 each for Advance General seating, $15 Prime Seating, $25 Priority Seating, and $50 for Premium seating (which also includes a CFCArts Cookbook and Autographed Poster).